Saint Luke, a physician at Antioch and a painter, was also an excellent rhetorician in Greek, his native language. He became a disciple of Saint Paul, the Apostle's fellow-worker and his faithful friend during his two imprisonments, and is best known to us as the historian of the New Testament acts of both Christ and the Apostles. Though not an eye-witness of Our Lord's life, the meticulous Evangelist diligently gathered information from those who had followed or listened to Jesus of Nazareth, and wrote, as he tells us, all things in order. His command of Greek is much admired. Saint Clement of Alexandria, Saint Jerome and Saint Thomas Aquinas state that it is he who translated Saint Paul's famous Epistle to the Hebrews, written in the language of the Jerusalem Christians, into the admirable Greek which we presently possess as the only ancient version. The Acts of the Apostles were written by the Evangelist as a sequel to his Gospel, bringing the history of the Church down to the first imprisonment of Saint Paul in Rome, in the year 64. The humble historian never names himself, but by his occasional use of we instead of he or they, we are able to detect his presence in the scenes of Saint Paul's life which he describes. We thus find that he sailed with Paul and Silas from Troas to Macedonia, where he remained behind, apparently, for seven years at Philippi. Finally, after remaining near Saint Paul during the time he was imprisoned in Palestine, he accompanied him, still a prisoner, when he was transported to Rome. Thus he shared the shipwreck and perils of that memorable voyage, narrated in Chapter 27 of Acts  which book no Christian should fail to read, along with the four Gospels. He then narrates the two years of Saint Paul's first imprisonment, ending in his liberation. There his narrative ends, but from Saint Paul's Epistles we learn that Saint Luke was his faithful companion to the last. 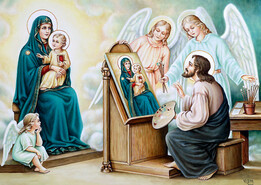 His paintings of Our Lady are still conserved with care in a number of places in Europe. Saint Luke certainly learned from the Mother of Christ Herself, the story of the Annunciation, the Visitation, and the Angelic mission to the shepherds of Bethlehem. After the martyrdom of the Apostle to the Gentiles, Saint Epiphanus says that Saint Luke preached in Italy, Gaul, Dalmatia and Macedonia. Others say he went to Egypt and preached in the Thebaid, the region of the Fathers of the desert. Saint Hippolyte says he was crucified in Greece. His mortal remains were transferred to the Church of the Apostles, built by Constantine the Great at Constantinople, with those of Saint Andrew and Saint Timothy. Some of his relics remain in the Greek monastery of Mount Athos. The Holy Bible: Old and New Testaments; Little Pictorial Lives of the Saints, a compilation based on Butler's Lives of the Saints and other sources by John Gilmary Shea (Benziger Brothers: New York, 1894). Let us not grow tired in doing good; for in due time we shall reap if we do not lose heart.